Florida Teak works closely with sawmills in Myanmar to choose old-growth logs that yield exceptional quality covering boards – coaming boards. This is a time-consuming process. Logs must be chosen to make extra-wide and long boards, then are air-dried for months. We check for cracking and then trim the pieces for export. Once in U.S., they are further dried and we give them a final quality control inspection. Our customers include some of the most prestigious sportfishing boat and yacht manufacturers in U.S. so we always keep an inventory of 200-300 boards, to insure we have the right size for any boat. All our boards are 5/4″ thick – 14-24″ in width – 9-24 ft. in length. We also have stock for smaller boats of 10-14″ width. We always strive to find matching boards to complete a set of two sides and a transom board. 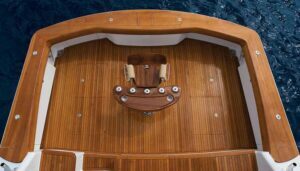 Florida Teak deals in carefully selected old-growth teak, we assure our customers that they will receive only the most valuable and versatile hardwood – high quality, old-growth Burmese teak. Not all teak is equal to old-growth Burmese Teak. There are different grades of teak available on the market, such as South American plantation teak and Indonesian plantation teak. These have inferior qualities to old-growth teak, as they are grown fast and harvested young. They have a lower oil and silica content that make them vulnerable to rot and termites, and their teak planks tend to crack and warp. Plantation grown teak is suitable for some applications, but only old-growth teak can withstand the test of time. 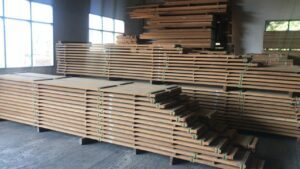 When choosing a supplier, carefully check what type of teak they provide. The price difference between old-growth teak and plantation grown teak make it tempting to use the cheaper alternative, but it will compromise the quality of the final product. Plantation grown teak does have its uses, we recommend it for mass-production residential outdoor furniture, indoor flooring and paneling, and other residential uses. Click Here to find out more.